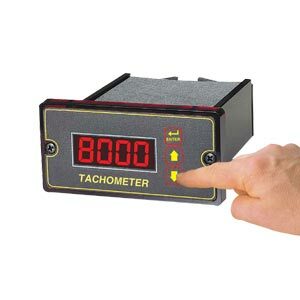 The OMDC-DM8000 is an economical microprocessor-based digital tachometer system capable of measuring shaft speeds lower than 1 RPM. With an on-board microcomputer coupled with sophisticated internal software and a quartz crystal controlled reference frequency, the OMDC-DM8000 is able to maintain accuracy of ±0.04%, even if the shaft is uneven. The OMDC-DM8000 is field programmable through the easy-to-use frontpanel interface and can be configured to display any desired unit of measure. Large 13 mm (½") 4-digit LED display numbers allow viewing under the most adverse conditions. The isolated 5 amp form C relay output can be configured for many different alarming conditions. Designed to use a variety of inputs, including the hall-effect solid state OMDC-PU-E Series pick-up, the system delivers trouble free operation at an economical cost. The OMDC-DM8000 offers the same enhanced display options and capabilities featured in our other digital control products, as well as the universal power supply and rugged european-style terminal strip. The OMDC-DM8000 can be used in process applications for monitoring speeds and rates, or counting discrete input signals. Process applications using counting may be batching, filling, mixing, punching, cutting, drilling, diverting, or alarming. While process applications using speed or rate monitoring may be conveyors, conveyor ovens, material flow, rotational rpm, and testing.